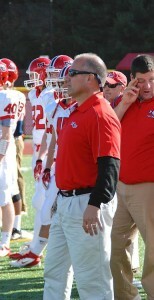 Frank Arcamone has been with the New Canaan Football Program since 1995. He started coaching Outside Linebackers until 2005 when he took over the freshman program. After five years with the freshman, he came back to the Varsity and now coaches the Inside Linebackers. Coach Arcamone has also been the Head Strength and Conditioning Coach since 1995. Coach Arcamone graduated from Norwalk High School in 1988. He was a multisport athlete playing football, wrestling, and lacrosse. After Norwalk Coach Arcamone attended Southern Connecticut University where he earned a Bachelors degree in Physical Education. He also attended the graduate school there and earned his Masters Degree in Health Education. Coach Arcamone is a Certified Strength and Conditioning Specialst (CSCS) by the National Strength and Conditioning Association. He also has a United States Weightlifting Certification (USAW). He was a nationally ranked powerlifter at 198lbs and 220lbs. From 1988-2000 he was ranked #1 in the East Region. Frank Arcamone has been a teacher within the New Canaan School System since 1995. Currently he is teaching Physical Education at Saxe Middle School. Coach Arcamone is happily married to his wife Beth. They have two sons, Sam and Jack.